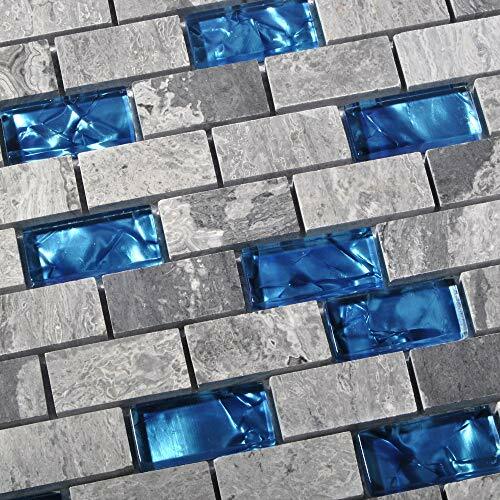 This is our new designed subway glass stone tile for interior wall and kitchen backsplash. It is made with ocean Teal blue glass chips and nature marble mosaics. The color of the stone chips is random, some chips looks grey and some chips are darker, because they are all made from nature stone, we keep their nature color, did not add any artificial dyer, and we only polish the surface of the stone to make it glossy. The whole sheet is 11.8'' x 11.8'' which is approaching 1 sq.ft. This listing is for 5 sheets per box ( covering 5 sq. feet). We do offer samples. And we suggest customers to order a sample before full size orders. We have our warehouses both in California and Kentucky. We use UPS ground service to ship tiles which takes 2-6 business days for delivery.